Need a fun and easy team-building challenge for back to school? We have you covered with our three favorite back to school STEM icebreakers! Whether you are involved with preschool kids, high school stucents, or somewhere in between, read on for STEM activities to get your students moving and working together as a team! Space exploration is all about teamwork. Each NASA rocket launch takes years of preparation and hundreds of scientists and engineers working as a team. This ensures that a safe and reliable rocket is built to hurl humans into space! Once on the International Space Station (ISS), astronauts must work together to survive the hazards of space (just watch any space movie). But do you know how astronauts move from their rocket to the ISS? A pilot carefully navigates the space vehicle to a docking port. Check out this video of SpaceX docking to the ISS. To simulate this maneuver, my Space Club students complete the Space Docking Challenge. 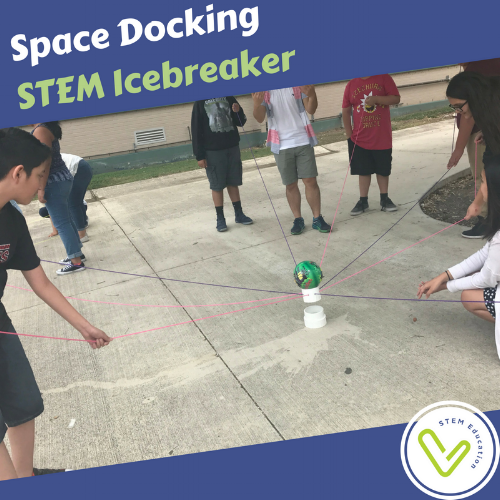 As shown below, eight students work together to move a PVC ring with a ball balanced on top (the astronauts) to dock with a larger ring (the ISS) placed on the ground. This activity is easily adaptable to any age by increasing the length of the string, size of the ball, or distance to the larger ring. We've done this activity with ages ranging from preschool to adults! 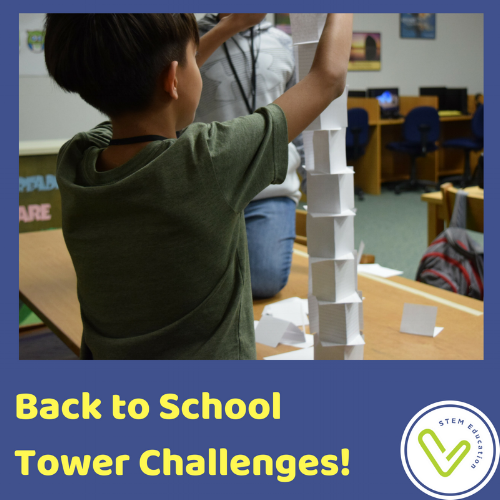 This challenge is a big hit during our STEM Family Nights, and you can find instructions in our planning guide. Add a hula hoop! Before lowering to the second ring, students must pass the hula hoop through every person while keeping one hand on the string at all times. Sounds impossible, but it can be done! Find a long stick. A flexible stick or pole makes it harder. We use straws that are taped together (one straw per person). Students form 2 lines facing each other. Everyone holds arms out and points index fingers. Lay straw stick across everyone's fingers. Adjust finger heights until stick is horizontal and everyone's fingers are touching the stick. Everyone's fingers must be in contact with the stick AT ALL TIMES. Must restart if someone loses contact. More ideas can be found on our Pinterest board, STEM Design Challenges and Icebreakers. 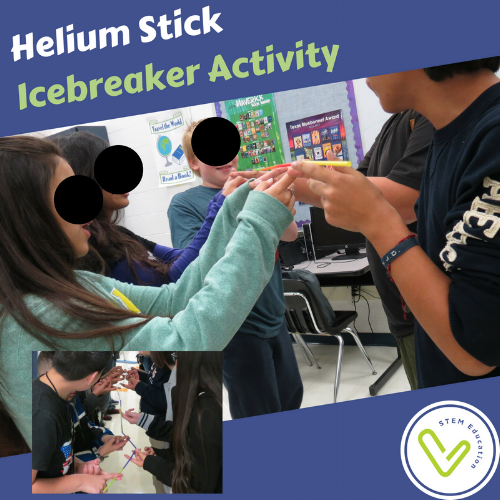 We also recommend our growing bundle of STEM Icebreaker Challenges for 2nd - 9th graders. This set includes 12 of our favorite basic STEM challenges that are low-cost and low-prep for any classroom! If you are ready to include more in-depth STEM challenges in the new school year, we recommend our 6 Starter STEM Challenges. From catapults to cars to an egg drop challenge, this is all you need to get started in STEM! Each activity has an in-depth student activity sheet along with a guide through the engineering design process. Materials are cheap, but the learning is fun, hands-on, and engaging!